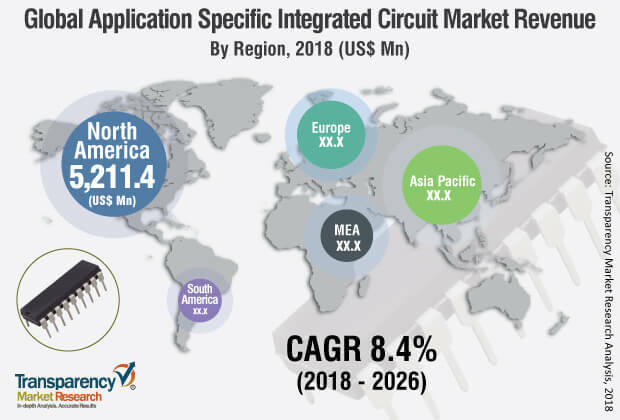 The global application specific integrated circuits market was valued at US$ 15,120.9 Mn in 2016 and is projected to register compound annual growth rate (CAGR) of over 8.4% from 2018 to 2026, according to a new report published by Transparency Market Research (TMR) titled “Application Specific Integrated Circuits Market – Global Industry Analysis, Size, Share, Growth, Trends, and Forecast, 2018–2026.” This is mainly due to increase in demand for application specific integrated circuits in smartphones and tablets across the globe, leading to the robust growth of the application specific integrated circuits market. Moreover, rising demand for application specific integrated circuits in industrial electronics, medical electronics, military electronics, aerospace electronics, and power electronics are also expected to have a significant impact on the global application specific integrated circuits market. Initiatives taken by different companies to increase system reliability are predicted to impact the application specific integrated circuits market in the coming years. The global application specific integrated circuits market is segmented based on end-use, type, and geography. By end-use, the global application specific integrated circuits market is divided into telecommunication, industrial, automotive, consumer electronics, and others. Others include domains such as medical, military and aerospace, auto emission control, sensors, and environmental monitoring. In terms of type, the market is divided into full-custom ASIC, semi-custom ASIC, and programmable ASIC. Semi-custom ASIC is sub divided into cell based ASIC and array based ASIC. Geographically, the application specific integrated circuits market can be segmented into North America, Asia Pacific, Europe, Middle East & Africa, and South America. Growing demand for telecommunication applications including system-on-chip (SoC) applications is projected to propel the revenue of the ASIC market in the coming years. Additionally, the growing use of application specific integrated circuits in consumer electronics industry for web browsing, e-mail, voice memo, answering machine, two-way paging, wireless PDA, and global positioning system are offering the consumer industry a prominent share in the global application specific integrated circuit market. The semi-custom application specific integrated circuits type is anticipated to hold the dominant share for the year 2018. This segment is driven by factors such as relatively easier design and cost effectiveness. Prominent adoption of application specific integrated circuits in the consumer electronics industry in Asia Pacific is likely to boost the growth of semi-custom application specific integrated circuits due to its prominent use. Furthermore, significant adoption of these circuits in industrial applications is likely to impact the growth of the segment during the forecast period. By geography, the global application specific integrated circuits market can be classified into five regions namely, North America, Europe, Asia Pacific, Middle East & Africa, and South America. Leading players are focused on carrying out initiatives for a better grip in the Asia Pacific region. For instance, in September 2018, Renesas Electronics Corporation, a prominent player in the ASIC market announced a strategic alliance with Alibaba, a significant retail chain in China for the growth of the IoT market. This move is expected to help the company gain a prominent position in the regional market in China. Key players operating in the global application specific integrated circuits market are Infineon Technologies AG, STMicroelectronics N.V., Texas Instruments Inc, Renesas Electronics, ON Semiconductor, Maxim Integrated Products Inc., Analog Devices, Inc., NXP Semiconductors N.V., Qualcomm, Inc., and Intel Corporation among others.